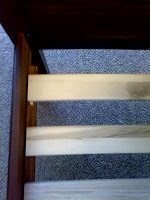 Home > Blog > Compares a platform bed versus a foundation for a mattress? A platform bed is a bed frame, often with head and foot board, with many wood slats running from side to side, which are preferably no more than 3″ apart in order to provide proper support for your mattress. A traditional bed can also have wood slats, but typically has only 1-3 to help support a foundation or box spring. The difference between a traditional bed and a platform bed, is that you can place a mattress directly on a platform bed without a box spring or foundation. With a traditional bed, you would place a box spring or foundation upon the bed frame and then your mattress would be placed on top. When using a platform bed your sleep surface will often be lower to the ground than it would be on a traditional bed. A box spring is a rectangular “box” made with metal springs inside that flex along with the mattress. It allows a firm mattress to feel a little softer due to the flexing of the metal springs. Box springs are primarily used with innerspring mattresses. We do not currently sell any box springs. If you purchase our innerspring mattress, you can pair it with a matching natural foundation. Some manufacturers (e.g. Savvy Rest) say that you can place your natural latex mattress on a box spring if it is in good condition, however, the weight of the mattress could eventually make the box spring bend and “sag.” Some manufacturers (e.g. Green Sleep) require that your natural latex mattress be placed on a proper foundation or platform bed such as not to void the warranty. A foundation is also a “box” but provides a flat, rigid surface. Foundations are typically made out of wood, with many wood slats running from side to side, like a platform bed. However, a foundation is covered with fabric such that the appearance is the same as a box spring. Foundations are generally recommended for use with latex mattresses or mattresses made with other dense material that are flexible (like memory foam), but need something sturdy to rest on. Unlike innerspring mattresses that derive some flexibility from the box spring, the feel of a natural latex mattress is somewhat independent from the surface it’s resting on. A foundation allows for support of the mattress, rather than acting as a shock absorber like the box spring. Standard height is usually from 7-9”, but lower profiles are also available. To summarize, if you have a platform bed, you can place any type of mattress directly upon it without using a foundation or box spring. If you have a traditional bed frame, you would need a box spring or foundation to place your mattress on. Innerspring mattresses are traditionally used with a box spring, but will work fine with a foundation. It is best to pair a latex mattress with a foundation or a platform bed, but some manufacturers may allow you to place a natural latex mattress directly on a box spring provided it is in good shape.